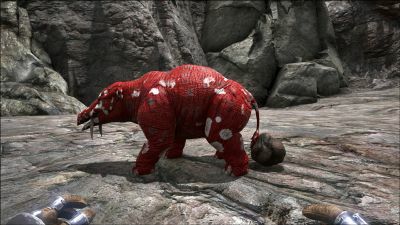 The Phiomia (Fee-o-me-ah) is one of the Creatures in ARK: Survival Evolved. Phiomia ignavus is another of the Island's generally docile herd animals. They are small enough that almost any predator can bring them down but large enough to provide plenty of meat. Were it not for the protection of the herd and their instinct to run from any predator, these would almost certainly be hunted to extinction. Phiomia's tusks and trunk make it especially suited to scavenging plantlife from the ground. It uses its tusks to dig up loose plantlife, then uses its stubby trunk to scoop the foliage into its mouth. Adult Phiomia often dig up food for their young, and watching a baby Phiomia attempt to use its trunk can be quite amusing. While it is completely possible to ride a Phiomia around, they are a meager choice. They work very well, however, as pack-mules. If you feed the Phiomia a stimberry, it serves as a laxative in the creature's digestive system. Knowing this, tribal communities often keep a herd of these as livestock to produce mass quantities of fertilizer. Phiomia will run away from the player when attacked. Without any increases in the player's movement speed stat, he/she will be easily outpaced until the creature thinks it's safe and stops running. When chasing a Phiomia, it is best to be near rocks or below cliffs, as Phiomia will run into these barriers and be cornered. A pig-like elephant relative. It mainly comes in black, greys, and muddy brown colors, and it has tusks with a trunk that looks stunted. It can be best described as a very heavily bulky tapir with tusks or a pig with an unconventional appearance. This section displays the Phiomia's natural colors and regions. For demonstration, the regions below are colored red over an albino Phiomia. The colored squares shown underneath each region's description are the colors that the Phiomia will randomly spawn with to provide an overall range of its natural color scheme. Hover your cursor over a color to display its name and ID. For example, "cheat SetTargetDinoColor 0 6" would color the Phiomia's "body" magenta. Once a Phiomia is attacked, it'll flee with haste, but it will often run into rocks, cornering itself for you. 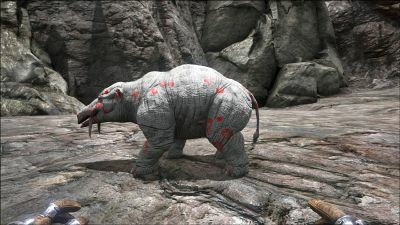 Phiomia are relatively easy to tame, you can easily knock them out with your fists or by using a slingshot to the head. However, they are easily killed so be wary of how fast you are hitting it. This section describes how to fight against the Phiomia. Phiomias are incapable of fighting back, so any confrontation is strictly one-sided. The Phiomia employs great speed in the battle, able to get away from most players that have a mount. If trapped, ambushed or bitten by powerful mounts, their demise is all but certain. If the player stands facing diagonally into their shoulder, they should move forward and keep hitting. Moving into their shoulder seems to lock them in place moving opposite you. Use a pick, axe or sword as the pike or spears knock it back, which loses the advantage. Otherwise, try to kill it before it puts distance in between you and it. Another option is using the terrain: Urge it that way so that it will run right to a wall which can`t be climbed. That will work with any skittish dino that can`t fly. It is recommended to start with a violent flurry of stabs with either a sword, pike or spear. If it persists to survive, kill it from afar with ranged weaponry. The Phiomia itself cannot harm the player, but beware of other animals. A running Phiomia can sometimes be the only signal that a large animal is running in your direction. Take note of these occurrences especially around areas known to harbor deadly animals. Severely bloodied Phiomias likely suffered run-ins with big animals like a Rex. The Phiomia cannot fight back or harm the player in any way. As long as it is the only animal around, killing it is extremely easy. Cargo: While they can't carry as much as some later-game mounts, they make good pack animals for early players (Level Health and Weight). Fertilizer: A Phiomia produces more Medium Animal Feces than other domesticated creatures. This makes them ideal animals to have when trying to maximize fertilizer production. Feed them Stimberries and they will produce a very high amount of feces (Level Health and Weight). Raw meat: Killing one gives large quantities of raw meat. ideal for taming carnivores that require large quantities of meat fast. Phiomias are unable to gather berries from bushes. Phiomia are an early member of the group Proboscidae, which contains modern elephants. The exact purpose of their tusk arrangement is uncertain, but they possibly used them to scoop up food or scrape bark from trees. Despite being an early-game weak creature, the phiomia has an incredibly long maturation time when raised from a baby, taking longer than even the majority of late-game creatures.